Valdon Gorham, manager of Cromer Amusements, directs a trator-trailer rig as it maneuvers to put a ride in place Thursday afternoon at the Highland County Fairgrounds. While admission prices and most other things will look pretty much the same when the 2018 Highland County Fair opens Saturday, there are a few new attractions for the 58th version that runs Sept. 1-8. One of the new attractions will be autocross, which begins at 6 p.m. Monday. There will be five autocross classes: front wheel drive; rear wheel drive cars, small trucks and minivans; UTV or side by sides; four-wheel drive vehicles, trucks and large vans; and an open class that the annual fair book describes as “run what ‘ya brung.” There will $250 prizes for the winners of each class, a $100 award for the longest jump, and a $100 award for the best looking vehicle. Also new this year will be credit cards being accepted to pay admission at the main gate only; a vendor who will offer bacon-wrapped, deep fried Orea cookies; and the order of the sales have changed a little from a year ago. The credit cards will be accepted only at the “green gate” located off Fairground Road across from the main parking area. Stratton said a 3 percent fee will be added for anyone using a credit card. The changes with the sales order is only a flip-flop of which animals are sold in which order on sale days. He said those orders are flipped back and forth each year. On Wednesday, the market barrow sale will start at 6 p.m. followed by the market goat sale. On Thursday, the poultry meat pen sale will start at 1 p.m. followed by the single fryer rabbit sale. On Friday, the market lamb sale starts at 6 p.m. followed by the steer sale, beef feeder calf sale and then the dairy sale. Daily general admission to the fair will be $10 per person and includes rides. An eight-day pass is $25. Those purchasing a pass will need to pay an additional $7 each day they want to ride rides. Shuttles will be provided for those who want a ride from the primary parking area to the main gate. And the Hillsboro Masons will provide free golf carts rides for anyone needing a ride on up into the fairgrounds. You can also catch a ride on golf carts that run around the fairgrounds. Stratton said there are several stops with benches around the fairgrounds where people can catch a ride to other locations. “They use the outside loop around the fairgrounds and can take you pretty close to anywhere you want to go,” Stratton said. Monday, Sept. 3 will be Senior Citizen Day at the fair. Anyone over 62, plus any veteran or current member of the military, will be admitted free that day. For several years the fair board offered one day a week when anyone could get free admission early one a particular day, but Stratton said that was eliminated two or three years ago. The rides are being offered by the same company this year, according to Stratton, but there will be a different selection. Valdon Gorham, a manager for Cromer Amusements which will provide this year’s rides, verified that several rides will be different. He said there will be a 65-foot tall Ferris wheel, plus several classic, family-oriented rides. There will be approximately the same number of vendors, Stratton said, with a few new ones mixed in. There will be more than 300 campers and recreational vehicles on the grounds this year. The fair kicks off with opening ceremonies at 8 a.m. Saturday, Sept. 1. Motorcycle races start at 11:30 a.m. the same day, the rides open at noon, and the fair queen and king contests start at 1 p.m. in the Multipurpose Building. Four-wheel ATV races start at 5 p.m. Saturday. Tractor pulls still draw the largest crowds at the fair, Stratton said. There are pulls starting at 10 a.m. and 7 p.m. Sunday, 7 p.m. Thursday, 7 p.m. Friday, and 6:30 p.m. Saturday, Sept. 8. There is a rodeo at 4 p.m. Sunday, a demolition derby at 8 p.m. Tuesday, and KOI drag racing at 6 p.m. Wednesday. Entertainment includes a trick roping display at 4 p.m. Sunday, Patrick Roush at 7:30 p.m. Wednesday, Lindsay Huggins at 7 p.m. Thursday and the Richard Lynch Band at 8 p.m. Friday. 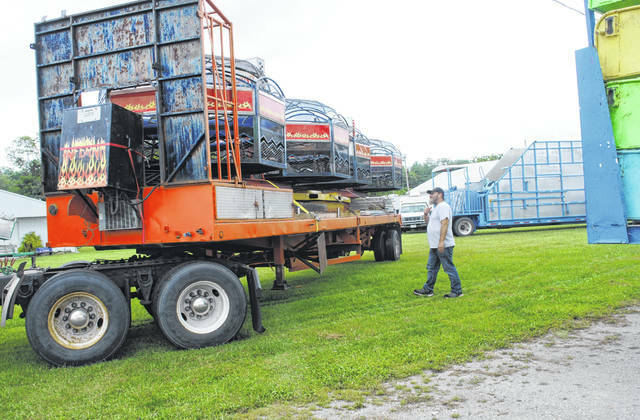 https://www.timesgazette.com/wp-content/uploads/sites/33/2018/08/web1_Fair-set-up-pic.jpgValdon Gorham, manager of Cromer Amusements, directs a trator-trailer rig as it maneuvers to put a ride in place Thursday afternoon at the Highland County Fairgrounds.